Every new project marks the beginning of a thrilling time during which we work together with you to pave the way for intelligent and trail-blazing solutions. Cutting edge technology is not enough to meet customer requirements in automation. This also requires a tremendous degree of experience and know-how. We at MKE additionally offer new ideas, absolute precision in implementation, and last not least a highly committed team of experts, working hand in hand, for whom competence in counselling and customer focus are not just empty phrases. Right from the very beginning, each stage of work will be carefully planned and discussed with you in detail: You will let us know your specific wishes and requirements. 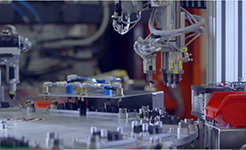 This is the starting point for us to develop a sound basic concept as a solid basis for planning, design, manufacture, assembly, programming, and for our full service to provide you with the optimum solution, a machine for automating complex processes, custom-tailored to meet your individual needs, fit for the future. We are committed to achieving the optimum result from planning to commissioning, and even beyond.